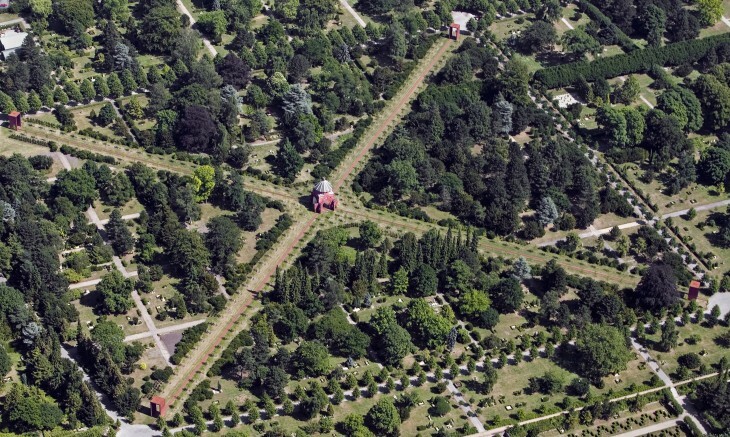 The Western Cemetery is the largest in Denmark, and impressive in every way. Not only because of its size and natural resources, although they are remarkable, but also due to the sheer number of famous Danes buried here and the amount of artwork visible on the tombstones and memorials. Western Cemetery is a hall of fame for politicians, artists and scientists. Due to its somewhat remote location, just behind the prison, between railway tracks and very busy streets, not many people come here – so it is always possible to find a quiet spot. In particular, the area closest to the main entrance and west of the large chapel has much to offer, including a hilly area around the beautiful lake. Here are found the graves of a number of artists and no fewer than five Social Democratic prime ministers, from Thorvald Stauning to Jens Otto Krag. Next to this is an area overgrown with ivy, which hides the grave of writer Herman Bang. The Western Cemetery is the obvious place to go in search of the final resting places of celebrities and artistic funerary monuments, as well as big lawns, long, straight lime avenues, trimmed beech hedges, labyrinthine paths and well-maintained scrub. Since it opened in 1870, hundreds of thousands of people have been interred here in the Western Cemetery. Many of the graves have been demolished. Today, because cremation is becoming more common and many people are buried in public facilities, there is still plenty of free space. More than 125 famous Danes are buried in the cemetery. The Western Cemetery has Catholic, Jewish and Muslim plots, as well as areas for different nationalities. A wide variety of exotic trees and elm, linden, beech, ivy. Squirrels, bats, foxes, frogs, toads, amphibians and newts. Birds including mallard, coot, jay, raven and red kite.